Levitating metrology; better levitation; NY design effort. The Instituto de Ciencias Físicas UNAM has developed a new contaminant detection technique. It uses sound waves to levitate droplets of water for sampling purposes. Researchers use a technique called laser induced breakdown spectroscopy (LIBS). 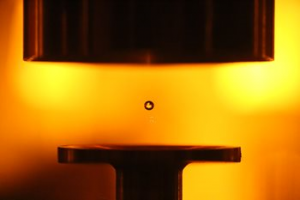 The technique analyzes heavy metals in levitating drops of water, according to The Optical Society (OSA) journal Optics Letters. LIBS can detect very low levels of barium, cadmium and mercury in just a few minutes, according to the journal. An LIBS system uses a laser, which hits a sample. This, in turn, vaporizes the sample. It then generates into a plasma, according to OSA. Researchers use sound waves to levitate the resulting plasma or samples. Researchers use sound waves to levitate droplets of water. This approach allows for spectroscopic detection of harmful heavy metal contaminants. Image Credit: Jairo Peralta and Victor Contreras, Instituto de Ciencias Físicas UNAM, The Optical Society (OSA), Optics Letters. The U.S. Department of Energy’s (DOE) Argonne National Laboratory has found a way to improve the ability to levitate tiny objects. Argonne National Laboratory uses intense sound forces to levitate or hold samples in container-free experiments. Researchers have been able to levitate objects like tiny droplets. They are able to levitate more than one droplet at a time. With the technology, multiple samples can be loaded into a system. The technology allows researchers to screen a variety of droplets at faster speeds. This concept isn’t new. Researchers have been using sound to levitate small objects for a number of years. Argonne National Laboratory, however, has found a better way to accomplish this feat by using less material. They are manipulating samples at a couple hundred microns in diameter. “We are using very intense sound forces to levitate or hold these samples so that there is nothing solid that needs to come into contact with them,” said Anthony DiChiara, an assistant physicist at Argonne National Laboratory, on the agency’s Web site. “The idea is not new, but because of recent developments, this technology today is much more feasible. The Saratoga Economic Development Corp. (SEDC) has launched a new IC design and technology initiative in New York. The new program, called the Electronic Design and Innovation Initiative (EDI2 Saratoga), plans to develop an IC design accelerator for electronic design automation (EDA) tools in the Saratoga County and New York’s Capital Region. SEDC is a private, non-profit consulting firm, which is designed to bring new investments in this region. EDI2 Saratoga’s founding partners include the SEDC, the U.S. Small Business Administration, Clarkson University, National Grid, Siemens, Center for Economic Growth, New York State Electric & Gas, SUNY Adirondack and ReWire Energy. ●Expanding the number of engineers with design experience, and increasing the number of students pursuing electrical engineering degrees. ●Providing innovators affordable access to powerful design software. ●Establishing academic, public and private sector partnerships to support technical and capital access for translating research and development to commercialization. ●Sparking workforce readiness through the education pipeline to produce and utilize these applied technologies.